Strathie Secure League and Cup Double! It may have rained non stop in Alloa on Saturday but the weather couldn’t dampen the spirits of the Strathmore 1st XV players, coaches and supporters on hearing the full time whistle signalling Strathie were the new Caley League Division 1 champions for season 2018/19. It also signalled their 14th straight win in a row remaining undefeated all season with 2 league fixtures still to play and a National semi final of the Shield competition to look forward to. Saturdays game against Alloa which the men in black knew a bonus point win would give them the league title wasn’t quite as how they’d envisaged they’d play to win the league. The wind and rain that swept across the Alloa pitch was a real leveller for both teams and probably suited Alloa’s game plan better. Strathie started with the wind advantage but didn’t really utilise it much first half and only managed one try in the opening hard fought 40 minutes through Glenn Feighan who intercepted a pass and ran through to score. Lee Alexander added the conversion after only 9 minutes. It was a forwards game for majority of first half with prop Tom Hall who deservedly got Man of the Match leading the charge on many occasions however it finished 0-7 HT. Stern words from head coach Alan Brown at half time must of been the trigger that the supporters who made the journey down and braved the elements to watch were hoping for as Strathie started the 2nd half much brighter despite the conditions worsening. Ronan Joy was first to score second half after exploiting a gap in the now tiring Alloa defence on 43 minutes with the extras added by Lee Alexander. This try was quickly followed up with Darren Bell scoring his first of two tries in similar style following quick ball from scrum half Callum Parsons again allowing the Strathie backs to slice through the dog legged Alloa backs on 55 minutes. Alexander slotted the conversion beautifully into the wind. With the pitch cutting up and no sign of the weather easing everyone knew 3 tries weren’t enough for Strathie so the visitors went looking for that fourth try to get the bonus point to secure the league title and it was the man mountain Marc Scoular who scored the crucial try driving himself over the line from close in just before the 70 minutes mark. Lee Alexander split the uprights to make it 4 from 4 for himself. Winger Darren Bell rounded off the try scoring with his second try of the game on 75 minutes and Mr consistent Lee Alexander made it 5 from 5 conversions to give a full time score of Alloa 0-35 Strathmore. Scenes of jubilation followed from the Strathie players, coaches and supporters as the trophy was presented by the SRU representative and the champagne then flowed sweetly. 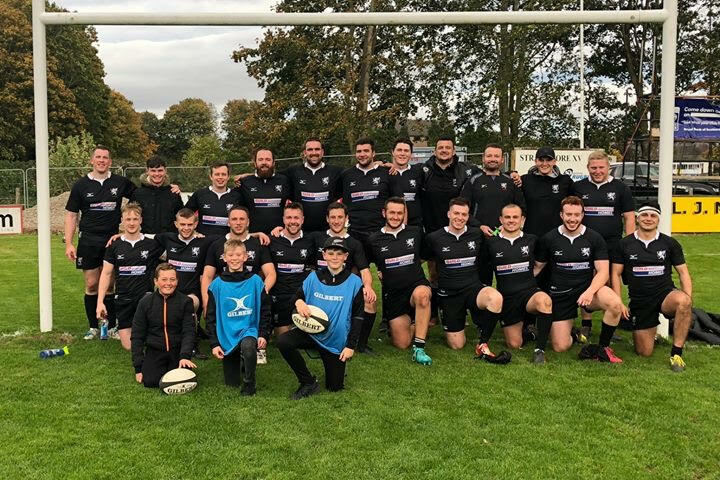 Strathmore RFC were Caledonia league Division 1 champions again securing promotion to the National league 3 for next season. Head coach Alan Brown commented “ We’ve done it ! The lads have been outstanding and have bought into my vision for the style of play I wanted. A year ago I was struggling with rugby but it’s been fantastic this season coaching these guys and it’s has renewed my enthusiasm beyond my expectations. Huge thanks to Grant Langlands our backs coach he has been tremendous all season and Paul Wilson our 2nd XV coach. It’s been a fantastic season for the club doing the double and still a national semi final of the shield to look forward to”.